Polemical works by Isaac Orobio de Castro, written by Isaac de Castro, Amsterdam late 17th century. Prevenci / ones divina a / Ysrael, contra la va / na idolatria de las gentes / Libro primero. / Pruevase que entodo quanto se avia de inventar / en el xp[chris]tianismo previno Dios a Ysrael en los 5 / libros de la Lei para que advertido no pudiesse ad / mitir tales errores. / Por el Doctor Yshac Orobio de Castro catredatico de Metaphisica y Medicina en las Universidades / de Alcala y Sevilla Medico de camara del Duque / de Medina Celi i dela familia de Borgoña / del Rey Phelipe quarto Professor Medico y / consejero del Rey de francia en la insigne / Universidad de Tolosa. I: first 3 ff. blank. f. [4r]: Title part 1.
f. [4v-5v], f. [6v]: blank. f. 6r: Laudatory poems for the author and his work by Daniel Levi de Barrios. f. 108r-109v: Table of contents chapters part I.
II: first 3 ff. blank. 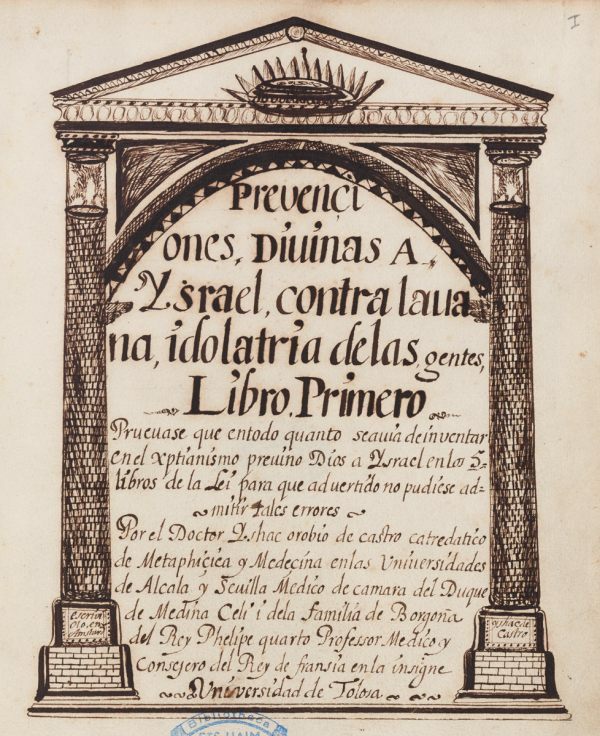 f. [4r]: Title part II: Prevenciones divinas / a Israel en los libros / propheticos /Libro segundo. Por el Doctor Yshac Orobio de Castro / cathedratico de Metaphisica y Medicina / en las universidades de Alcala y Sevilla / Medico de camara del Duque de Medina / Celi y de la familia de Borgoña del Rey Phelipe quarto Profesor Medico y conseje / ro del Rey de francia en la insigne univer / sidad de Tolosa de presente en Amsterdam. Escrito por Ishac de Castro. f. [4v], 2v, 171v, 174: blank. f. 3r-171r: Text part II. f. 172r-173: Table of contents part II. Other copies in EH 48 B 13; EH 48 C 1, 2; EH 48 C 12; EH 48 D 6; EH 49 A 16. According to Yosef Kaplan, Prevenciones divinas is one of the most incisive Orobio’s writings against Christianity. It was written between 1668 and 1675, and circulated widely in manuscript form among Sephardic Jews in Western Europe. It is divided in two parts. In the first book, Orobio intends to prove that, in the Torah, God already warns the people of Israel against Christianity and its attacks on the Law of Moses. He also criticizes the Christian method of biblical exegesis (especially its attempts to find mystical meanings instead of choosing more obvious explanations) and the accuracy of the Gospels as a historic source. The second book is mostly a refutation against the Christian interpretations on the Old Testament prophecies about the coming of the Messiah, especially on Daniel 9 (20-7) and Isaiah 53. Baron D’Holbach’s Israel vengé ou Exposition naturelle des Prophéties hébraïques que les Chrétiens appliquent à Jesus, leur prétendu Messie par Isaac Orobio (London, 1770) is the first printed edition of Orobio’s polemical writings, freely translated into French, and including abstracts from the Prevenciones divinas, under the title “Dissertation sur le Messie”. I. S. Revah, “Spinoza et le Dr. Juan de Prado”, Etudes Juives, I, Paris, 1959. Adam Sutcliffe, Judaism and Enlightenment, Cambridge, Cambridge University Press, 2003. Yosef Kaplan, From Christianity to Judaism: the story of Isaac Orobio de Castro, London, Littman Library of Jewish Civilization, 2004. Spanish / Paper / 26,1 x 20,2 cm. / 2 parts, I:  + 109, II:  + 174 ff. / 26 lines to a page / Current late 17th century writing / Catchwords at the bottom of each page / Two titles, one of part I, one of part II, both written in drawn frame, partly in large capitals / Drawn ornaments at the end of each chapter / Contemporary gold-tooled leather binding / At the bottom of the columns adorning the first titlepage is written in very small writing: “escriviolo en Amsterd Yshac de Castro”. Fuks 195. Fundação Calouste Gulbenkian.